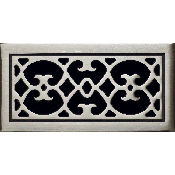 These solid white bronze metal air grilles are handmade in the US by using a unique sand cast. Use decorative air returns in your floor, wall or ceiling, they are strong enough to handle it. 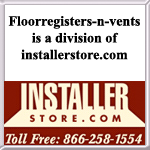 If you are using the metal air grilles in the floor, please make a note about this during your checkout. When the decorative air returns are crafted, the Renaissance faceplate is made to be 1/4" thick to give it an old world feel. Our metal air grilles come with pre drilled screw holes for easy wall installation and mounting. Also the decorative air returns are made with a screen backing which will help hide ductwork while allowing air to flow in your home. The white bronze finish is coated with a clear polish to help protect the faceplate. The Renaissance metal air grilles will look great in your home and ship to you for just one low cost! Get the decorative air returns on order today since they may take a few weeks to be sent out. Tip: To order the Renaissance metal air grilles, make sure to get your measurements from the actual hole opening in your wall or ceiling. The 24 inch x 8 inch decorative air return will cover a hole measuring that size. The faceplate of the Renaissance metal air grilles will be approximately 2 inches larger than the listed size. This may vary from vent to vent since they are handmade. Important: Since the decorative air returns are made to order, they can take between 7 and 9 weeks to ship out once payment has been made. This is also considered a non-returnable, special order item that cannot be canceled once order is placed. These metal air grilles are available for purchase with a damper unit which can be opened or closed when diffusing air. For more decorative air returns offered by Classic Grilles, view our selection in the wall return grilles category. Our solid white bronze metal air grilles are truly one of a kind and will make a great statement piece while still functionally covering ductwork.